Joe Bastardi's 2011 Arctic Sea Ice Prediction | Watts Up With That? Joe Bastardi paid a visit today in Sea Ice News #30 and left a comment with a forecast. is for NORTH of the arctic Circle. I was not forecasting for exclusively the area north of 80 north. I think we will find that it was a warm summer overall north of the circle, but we had a nice [ice] cube in the middle! In addition the sea ice forecast I made was for a min between 2008 and 2009, after a rapid spring melt, a leveling off, which is close to where it wound up. Remember I have been debating publicly and visibly the death spiral people on this matter. My forecast for next year is for sea ice to melt only to levels we saw back in 2005, or 06. If I had to put a number on it, I think it would be around 5.5 at its lowest. The ice is coming back, will do so in forward and back steps, with forward defeating the back steps. I am on record as saying we will be back to 1977 levels by 2030. The real problem would be is if there is no corresponding drop in the southern hemisphere sea ice. Like the 70s, cries of ice age will start again. So my forecast for next years melt is for 5.5. November 23, 2010 in Forecasting, Sea ice. Thanks for the bottom line. God forbid we fall for cries of an ice age again, although I wouldn’t be surprised. You don’t know an ice age has occurred until you are 100 years into it. Just like you don’t know an economic bubble has occurred until it has popped. Well, not an exact analogy. People and nations should look forward to adaptation to changing conditions of the colder variety and adapt however. If the solar minimum doesn’t abate soon, much colder conditions should be anticipated. Let’s hope that Antarctica’s ice edge, which in several places extends beyond the “average” line, stays away from the South American horn. With our cold Pacific, we don’t need the Circumpolar Antarctic current to invade the Atlantic to a greater degree than it already does. What no death spiral? Quick call Mark the prophet of doom for an enforced re-education. Maybe a trip to Cancun on the governments expense. I think Joe is more or less right on and I suspect the Antarctic will not shrink much if any and it to may grow. This of course comes at a time when I am working on a couple of resource development studies in the mid arctic region. Put me down for less than 4.0 for a new record low. Darn! Melt the ice caps! Tropics from pole to pole! Please indulge me on the eve of a revolution. If you feel﻿ you are being﻿ inconvenienced by the national op-out day, just think about how inconvenienced the people who fought the American Revolutionary War for you felt. My guess, at this time, is 5,499,999 km^2, if it goes below 5.5E6, I’ve bested Joe B.
Oh man, I hear ya. I’m in Eastern Canada and while we had a very mild winter last year and so far this year, the Jet Stream is now well south and temperatures have dropped suddenly and we now have snow on the ground. The West is getting it bad. I’d go for some tropical weather right about now. It’s so refreshing to see that instead of hearing how the current year is the X’th lowest year on record completely disregarding any possible recovery. And the South Pole is a good thing to mention as well. Should not the South Pole be going in backward steps too? The fact that it isn’t leads to some strange discrepancy. The Russian have been saying we are heading into an ice age for quite some time… we know some will blame CO2 for it though!!! Cool spell hitting California the next couple of nights. Lancaster is expecting a low of high teens to low 20’s, and Paso Robles (wine country) is expecting low 20’s for Wed & Thurs nights. When Joe speaks of a warm or cool Arctic summer, is he referring to temps? If so, what data is he using to verify? I sure hope it isn’t GISS. I say we put up a chart of predictions. I’m going for 4.75 extent as per JAXA measurement. I think Joe said Alaska and Russia would have another cold winter, so that will be interesting to watch to see if it comes out right. I love this guy. He is a Weatherman. lol. Fearless. Makes money on being right, not on being an alarmist. Anthony, you got your first prediction. Bank it. The Republic of The United States of America! I guess that would make us RUSA. If the chant ever became popular, R-U-S-A, R-U-S-A, that would make Aaron Russo really really proud. Yes, that most certainly would be a problem. A rather big problem. Mankind has been griping about the weather since the dawn of time. Only recently have some begun to panic over the weather. There will be genuine cause for concern should the Antarctic Circulation get diverted or impeded. I expect a rise too, slightly above 2009 levels. The little solar activity, the PDO, the AMO… everything is ponting to a recovery. The drop in 2010 didn’t come unexpected, as we have not seen yet 3 years of continued rise, and it had risen the 2 years before. However, if it doesn’t rise next year, that will be quite a surprise for me. As much a surprise as to make me rethink about this whole issue and wonder whether the arctic ice is really in a “death spiral”, no matter how slow, fast, beneficial or inconvenient. The only people who don’t know when we’re experiencing an economic bubble work for either the Fed or the executive branch. How will the tune be in 2025? Well we don’t know why ice forms north of 80-north at the same time antarctica has become a freezing hell when the rest of the world is in a global warming death spiral that makes us leap frog towards the next major catastrophic climatic change, never before seen in a billion year, ice age. So that’s why the worlds government really need to up the research grant for the 45th consecutive year. We just want to understand the horrors we’re facing today, don’t you? Or should we just leave to your grand children, who will be living in ice caves being hunted by a hundred thousand evil polar bears? As I drove to work this morning at minus 36 degrees c , I was confronted by the shear absurdity of the whole conversation. ( central Alberta, Canada) Please maintain the battle for common sense. Mediocre summer ice in 2010 is in direct relation of recent warm North Atlantic SST peak and thus relatively “warm” Arctic sea. North Atlantic SST heads down now, Bering sea looks cold so all indicators point to ice increase in near future. DNS value for today is 629. Oceans continue to cool including the Med. At the end of this month most of Western Europe, including parts of Portugal, Spain, and Italy, the US, Russia and Asia will be covered by snow. This is before the start of winter. In the US it’s raining snow and cold records. Also have a look at the SH where all the land masses show neutral-negative temp anomalies http://wxmaps.org/pix/temp7.html and have a look at the Antarctic Ice Extend which shows a record extend. We clearly witness a change shift here to a colder weather regime. I really hope it is their last. To which I would add “The people best able to predict an economic bubble are those who cause it for personal gain”. Oh can i have a go 5.75, not much wind and a lot of cloud cover is my guess, oh thats right its CO2 that melts ice caps, silly me well i’m sticking with 5.75. Al Gore said that there will be no ice on the North pole in 5 years time, 4 years ago. Because he is rich, he must know something, I follow the money, and believe in Saint, Prophet, Pope, Cult-leader, Captain of Spaceship Gaia, Chairman of the Board, Nobel Prize winner, Al Gore. With such peer-review he can’t be wrong! Since the start of the satellite record in 1979, scientists have observed the continued disappearance of older “multiyear” sea ice that survives more than one summer melt season. Some scientists suspected that this loss was due entirely to wind pushing the ice out of the Arctic Basin — a process that scientists refer to as “export.” In this study, Ron Kwok and Glenn Cunningham at NASA’s Jet Propulsion Laboratory in Pasadena, Calif., used a suite of satellite data to clarify the relative role of export versus melt within the Arctic Ocean. Kwok and Cunningham show that between 1993 and 2009, a significant amount of multiyear ice — 1,400 cubic kilometers (336 cubic miles) — was lost due to melt, not export. “My forecast for next year is for sea ice to melt only to levels we saw back in 2005, or 06. If I had to put a number on it, I think it would be around 5.5 at its lowest. My gut feeling given official voice by Joe Bastardi, I’m with you brother, 5.5 it is. Ironically like its evil relatives Communism/Marxism/Fascism/Socialism/Liberalism, the miserable relentless cold advances on: 2 steps forward – 1 step back. If this really is a generational length repetitious long cycle, one might compare us now to exiting the Eisenhower fifties about to enter the 60’s and 70’s. Yup, that was fun. This time it had better shut up the ecophobic warmie cult! Check out AMSU channel 5. Temp is below “average” for the first time this year…. So what is your prediction then? Yeah, but in 2011 there gonna be a heat wave in Timbuktu, a drought in Burkina Faso and floods along the Danube – irrefutable proof of global warming. IS NOT CHANGING and temperature is a measure of energy, then temps would have responded to the higher levels that the IPCC forecast had them. prove that once again mans folly in thinking he can control what he did not create. continue up. But you at least have the way to watch. Lets give the cold PDO and AMO ( heck I didnt even bring up solar cycles, volcanoes, etc) their chance. The fact is that the true DENIERS out there simply want to deny the chance for a level playing field objective test. And the reasons, I believe, are not about getting the right answer, but force feeding a predetermined answer. it will prove that you should have the title. As this prediction exercise likely will have oodles of contenders in the end, I’ll skip the GSLP”method” and follow my “gut feeling”. I can go on record for a 2001 september minimum of 5.3Mill km2. It is definitely interesting to watch the current AMSU development, but I think we should follow the situation for a while before putting too much emphasis on short time data. I have however also looked AMSU for a while, and find the tendency of relative cooling of the troposphere/lower atmosphere and simultaneous relative “warming” of the stratosphere to be very interesting. A couple of aspects (and I would appreciate corrections if I have misunderstood, and of course supplements). 1) The “heating” of the stratosphere means that the usual causal principle of GHG blocking IR back-radiation, has either been reduced (does BTW not fit with the CO2-trend”) or been offset by internal (unknown?) processes, or external forcings (external radiation? ), or a combination of these. 2) A “hotter” stratosphere could possibly also signify a stronger back-radiation from earth AND the atmosphere, implicatinog that the earth’s radiative imbalance have been reduced, and may even reverse. (Anyone with model or real-world numbers for this?). Don´t forget M.Vukcevic temperature´s relation with GMF. Nature, as common sense shows, does not have water thight compartments between electromagnetic frequencies, it continuously change from one to the other. It is unexplainable to think exlusively in LWR(IR)-Temperatures, as our daily experience, beginning early in the morning, when preparing our breakfast we make use of power to obtain heat. Thus, the Max Planck equation united all fields as the current Power equation it is also a unified field equation, though with changed “characters” and “sacred units”:Joules in the first case, watts in the second. This way nobody knows they are speaking the Same Language= The Babylon confusion, where everyone tries to weight up their prefered “angel”. What it will make a profound change in evrything and everyone it is a simple and humble Ipod App, which shows the Gravity Acceleration changes(This is possible as this and other gadgets, in order to make possible the screen image to turn around as we turn around the gadget). During the recent February 8,9 Richter earthquake, in Santiago, Chile, a school had installed an accelerator connected to a sirene, which woke up a watchman and his wife 5 minutes BEFORE the earthquake. Liberalsim? Are you sure? I would imagine Nick Clegg would be rather unhappy at being classed in the same group as the others. I would imagine that if the LibDems are in there, more radical political parties such as the Tea party and Republicans should also be included. I suspect though that politics in the USA will always be a mystery to the moderate voters of Europe. Snowing here in the UK, snow on Snowdonia much earlier than usual. Personally I blame David Cameron. The weather was much better and warmer under labour. I am so happy to see Bastardi make this predicition and the more even important longer term prediction that arctic sea ice will continue to recover through 2030. The sea ice, I believe, will prove to be the decider of this great climate battle. My own prediction is that we will know the answer to this question in 5-7 years, as I expect sea ice extent, area, and volume to rapidly decline. And the new cryosat satellite will soon weigh in with its measurement of ice volume. See: http://video.hint.no/mmt201v10/osc/?vid=55 for excellent analysis of arctic ice by someone who has over-wintered on the ice pack and spent a career studying it directly. What a great experiment this will turn out to be!! So what will be the skeptic fall back position when we have ice free arctic summers by 2020 (instead of the predicted recovery)? I will remember this prediction by Bastardi – I already have a screen shot of the page. If he’s right, more power to him and good news for the world. If not, well, real problems lie ahead, especially if the frozen methane hydrates thaw. So Will, what was the ice doing before 1978 then? The only thing you get from cherry picking is enough cherries to bake a pie. Cold snap here in the UK, how I miss that global warming! The big question is, will the ice recover quickly enough over the next few years (as it will) to stop government bodies wasting even more tax dollars on AGW? I fear it won’t, but I’m still wondering how all the ‘experts’ are going to squirm out of it! My idea is that the climate modellers (mathematicians) will get hung out to dry by all the other departments. It’s going to be an academic bloodbath of blame at some universities. Can’t wait to see it start at mine, I’ve booked front row seats. The problem with Bastardi’s analysis, that is a net transfer of heat from the south to the north, is that southern hemisphere atmospheric temps are also increasing (not as much but increasing) and South American glaciers are melting in tandem with northern counterparts. Antarctica enjoys more thermal isolation than does the arctic. GRACE shows a noisy signal for the antarctic land ice mass, but a decreasing signal. CRYOSat will so provide it’s own data on that issue. We’ll soon know if the intra-global heat transfer mechanism of Bastardi holds any water whatsoever. Increasing atmospheric CO2 is still absorbing outgoing infrared radiation and distributing that heat to the atmosphere – and will continue to do so in an increasing fashion as we rapidly (and wantonly) oxidize the world’s supply of reduced carbon that it took nature hundreds of millions of years to sequester underground. More details on the UK ‘s early and cold winter. If Joe is right, and I think he is, the world won’t need a high tech ice measuring system. It will blatantly obvious to all but the lunatic fringe. Geology and measured history are there and un-spun. Models that don’t work if the CO2 levels reach 1200 ppm aren’t worth very much, certainly not what they’ve cost the taxpayers who’ve footed the bills. On the other hand, Joe is using simple observations and a non-computer model to predict the future. It would appear that a lot of businesses think he’s doing an excellent job. Personally, someone who’s got some skin in the game (be right or go home), is a lot more credible than those who reach out to the organized extortionists (aka Gov). The sea ice, I believe, will prove to be the decider of this great climate battle. If he’s right [Joe Bastardi], more power to him and good news for the world. This is not a “great climate battle”. and a complete waste of time for important scientific discovery that could be used to protect our species from the coming cool-down. And if Joe Bastardi is right, it is not “good news”. It is very bad news and even worse news because the idiots in charge have been barking up the wrong tree….so our species is in no way prepared. Thanks for the comments Joe. Your reasoning is elegant and practical. Based on your methods, I’ll throw 5.8 out there and see what bites. I’m even thinking we’ll see 6.0 broken? We’ll see when April rolls in. Will Stewart raises an important issue. I presume what he is suggesting is that there is an auxiliary hypothesis relating to melt versus export ice that if true supports the principal hypothesis that global warming is still occurring (whatever the cause) and that Arctic sea ice (of the right sort) is disappearing. The problem with this from the point of view of a relatively neutral bystander is that the continual appeal to ad-hoc hypotheses to protect some underlying theory from refutation is the surest way to ensure that theory’s destruction. What I would like to see is a clear prediction (or indeed retro-diction) derived from the AGW research programme that demonstrates unequivocally the link between emissions and climate change. Einstein’s Relativity was not accepted for a decade until Eddington’s observation of the effect of the sun’s gravitational lens provided powerful confirmation of a theory that many still disputed. A theory that explains everything, explains nothing. A theory that successfully predicts something is quite likely to predict another. Don´t forget M.Vukcevic temperature´s relation with GMF. Don’t forget Enneagram that (e – m ) stands for electro – magnetic; but ‘wobble’ happen to be more attractive word than ‘jerk’, as seen here too. The only warm place in the world will be China where they are building 1 to 2 coal fired power plants a week. CO2 helps plants grow, so China will be “globally warm” and have food. I also wonder if soot helps warming other than the poles?? By the way, the troposphere is shrinking (cooling) due to lack of UV from the Sun. Look at the latest 10.7 cm Flux values. The Flux is at 75. The lowest value is 65; at this point in the Solar Cycle, the Flux should be at 175 [the max is ~280 corresponding to a Sunspot level of ~260]. 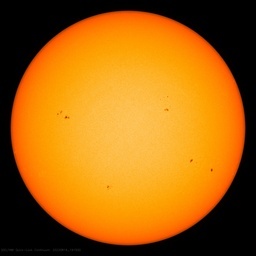 Quiet Sun and more heat escaping due to a thinning troposphere, I go with 5.8 Mill km2. According to the “consensus”, there is supposed to be enough CO2 in the air above me to cause it to warm. I dare any “consensus” scientist to stop by my house and put their tongue on any metal surface today. I’ll even let you try the Sun-exposed ones. Hell, even the wood siding is cold enough to cause your tongue to stick to it. If you respond by saying, “That’s just weather”, you have just proven my point. Weather kicks CO2 in the arse! Joe Bastardi has been right. Whatever factors he has been using for study has been working pretty well. The global warming predictions of a death spiral are not working out. Whatever factors they are using for study are nor working well. If your hypothesis is wrong you have to junk it. That’s all. Owen, you really don’t get it – true skeptics (not the right wing politicians who have glommed on to the skeptical position) are interested in good, verifiable science, which we do not have at this point – on so many levels. If the arctic goes ice free & you can link it to CO2 (separating the very real effects of the AMO & PDO cycles), then there would be some data to support the AGW position, but we don’t have that data now. In fact we have just the opposite. Read Bastardi’s post again & understand what he is saying. Given we know that we have a warm bias due to a warm PDO & warm AMO, if the IPCC models were right, we should have observed temps that are exceeding the IPCC models since the model is only working on CO2. Observed temps = CO2 forcing + AMO forcing + PDO forcing. The reality, even with the warm bias of the AMO & PDO, temps are lower than the IPCC model would forecast. This is such an important point that Joe has been pushing for years. This is real observed data – not models – & this observation, at the very least says the real CO2 forced warming is less than the models forecast, if not completely absent. So, what do think will happen as we loose these warming biases – as the PDO & AMO go into their cold cycles? Don’t bet on any net warming of the global average temps. Again, you needed to read Bastardi’s post more closely – we need time to get this kind of data before making decisions that essentially re-engineer society. What are you worried about? If you are right, time & the data will validate you & we haven’t lost anything in the mean time. That’s all Bastardi is asking. He’s not saying your are wrong – he saying let’s spend the time to do the science right. That is the essence of the skeptical positon. That used to be how all science was done. You probably haven’t followed Bastardi’s forecasting over the years, but he is certainly one of the best long term forecasters in the business. I would not bet against him. And thanks for the article, this is an experiment that will be done no matter what. Is it not true the Southern Ocean feeds the North Atlantic? Is the SO warming or cooling? It’s going to be an academic bloodbath of blame at some universities. Can’t wait to see it start at mine, I’ve booked front row seats. Curiously your “nome de plume” means -almost-to “Kiss the hand” in Spanish. Buy more popcorn!, as we have said here, many times, at WUWT. It is currently -23 degrees at Meacham, Oregon. And sunny. The air is bone dry. That is absolutely false! !, and I tell it from SA Millions would than God if it would be the contrary, but, unfortunately IT IS NOT!. Guess you OWE a lot to your Prophet…. From the various comments I wonder why no one has mentioned Nigal Calder or Gerald Roe’s papers which have shown the Milankovitch theory, after adjusting, show a very close correspondence. Their adjustments indicate the ice age began about 5,000 years ago. “In this case the basic correct observation is the following: If you suddenly get more sunshine near the Arctic circle, you don’t immediately change the ice volume. Instead, you increase the rate with which the ice volume is decreasing (ice is melting). Isn’t this comment trivial? The lesser cycle of warm periods encompassing a few centuries appear to have been a bit colder each cycle. I dare any “consensus” scientist to stop by my house and put their tongue on any metal surface today. Looking 10-15 years ahead, you might appreciate the current ‘warmth’ a bit more . That LICKING A METALLIC SURFACE TEST of yours, should be immediately considered as the International Standard for determining the Freezing Point of Water and enforce it as obligatory for any Global Warming Scientist as a condition for attending current sinful Climate Jamborees. Nice assessment. I use the site below to follow the global SST machinations. It doesn’t have an archive so I save the graphics each month and build a sequence of each area so I can click through and see how things are developing. You may or may not find it useful. It’s updated daily so you can use your own progress time frames. I respect Joe and have begun to follow some of his forecasting, but I believe Joe’s Sea Ice forecast is based on many assumptions related to solar cycles, the PDO, the NAO, AMO, etc. Joe doesn’t seem to be one of those who thinks that the 40% increase in CO2 since the 1700’s can have much of an effect on altering the ocean cycles. Furthermore of course and related to this lack of belief in the longer term effects of CO2 would be Joe’s implicit belief that Trenberth’s “missing heat” has not gone into the ocean at all and most likely isn’t “missing” at all, except in Trenberth’s mind perhaps. I’ll stand on record as saying the Joe will be proven to be wrong not just about 2011, but about the next 20 years as well. Not only will the Arctic Sea Ice continue with the longer term decline it has been in since even before 1970, but it is very likely we will see a seasonably ice free Arctic by 2030. This fall so far has shown a continuation of the weaking of the polar low, with large masses of cold air already being forced out of the Arctic because of high pressure over the Arctic areas. This already portends a lower winter sea ice growth (and certainly thinner). This change in the atmospheric pressure regime over the N. Pole has been discussed at length here on WUWT by several Ph.D. experts, but it seems to not have influenced Joe’s thinking for some reason. The erroneous assumption by many is that the changes to climate caused by CO2 are linear or even logarithmic in nature– they are neither. The climate record shows clearly that the changes come in sudden shifts of regime, as one would except from a system pushed to edge of chaos. The earth has seen 800,000+ years of CO2 at levels 40% less than we have now. To think ocean cycles and other climate inducing natural cycles would not be effected (in a chaotic way) by this geologically speaking sudden rise in CO2 is illogical. Thanks Joe and Anthony for fighting the good fight! Keep the faith. I hope Joe is right and by 2030 you are both arguing with the MSM that we are NOT all going to die from global COOLING! That sums a lot of posts here which boil down to short term timscales and micro geographical extent. Neither of which tell us much about the overal picture of what is happening and why. But if we wait 2o years for actual model to work, think of all the alms the Gaia priests will miss out on!! Vinod Kosla/Al Gore et al at Kleiner Perkins won’t have any rent seeking argument if we wait for the results. They might not be the “right” results!! Anyway, the answer is 42. I hope I can make it another 30 years to see the results. My first 68 have been up and down, hot and cold; a lot like the weather. These factors ,which if they continue to phase toward a colder mode, will mean increase sea ice for the globe and colder,not warmer temperatures. I say all of these factors govern climate,and futher they are tied into solar activity to one degree to another. I say if solar activity stays quiet,the above will or should tend to phase towards a colder mode in the coming years,resulting in colder global temperatures. When I look at past data in temp., and contrast that to co2 concentrations ,I see no correlations. Past history more then anything, tells me co2 does not cause climate change,rather the items I have mentioned above do. As Joe Bastardi said we will have our answer, I say sooner rather then later.
. . . and good news for the world. I don’t think so. Are you paying attention? Ironic, we may need every GHG we can muster in order to forestall the coming ice age, he he! Joe, 30 years, are you trying to imply that the sun has something to do with the weather, shessh! Did you even get to -2° F ? Ellensburg, WA hit -8° F. Over in MT, it is even colder. I’ll pass on the tongue on metal test. Thanks. I was impressed by the accuracy of Joe’s ice-forecast last year. I was also impressed that he could say there would be more melt than the year before even while standing up to the Alarmist “death-spiral” camp. It seemed a sign of a person who was looking at the big picture. Most seem utterly caught up in the smallest fluctuations. The graph that most use only shows the past few years, and last year the “current-ice-level” line was “highest ever” in March and yet “lowest ever” not many weeks later. It is great fun to listen to the cheering and howling that occurs on both sides, as the smallest blip occurs on the graph. However I don’t think it pays to take it all that seriously. The wrench in the works may be the “quiet sun.” Joe uses a lot of painstaking research of weather patterns from the past, but a “quiet sun” is not something we have modern records of. It may cause unexpected fluctuations, both in terms of the cooling many seem to expect, and also in terms of back-lash warming which many don’t expect. No major shock to the world’s weather systems can only include an action, without a reaction. A slosh in one direction always seems to also cause a rebounding slosh in the opposite direction. Volcanoes not only cause cooling, but also apparently cause the delayed reaction of a warming El Nino, a few years later. What may really test Joe, and all forecasters, will be the actions and reactions caused by the “quiet sun.” You can’t go back and look at old maps, as much as you need to look hard at the current maps, and use all the painstakingly gleaned knowledge you own, about how the weather actually works. What do you decribe as normal? zero anomaly by this graph? or zero anomaly by this one? Not exactly a fair question, but a more specific prediction of what you mean by normal temperature in march of 2011 is what I am asking for. Short term cooling between now and march 2011 doesn’t mean the end of global warming. As for the ice extent in the arctic, if the Beaufort gyre does in 2011 what it did last year, the multi-year ice will be essentially gone. Walt Meier’s video of the ice that Antony posted earlier shows the beaufort gyre stripping the multi-year ice from the area north of greenland and baffin islands where it accumulates and transporting it to open water where it melted. I think that as the total volume of ice shrinks, there will be more ice movement, and a higher chance of ice moving to warmer waters where it can melt. And that is what I base my prediction for a record low next year. Well “nice” cube works for me; bet the polar bears think so too; they don’t really like those silly sculptured ones that look like the kiddies’ playground jungle jim ! Atlantic still seems warmish. Can Bob give us some guidance on the latest AMO figures, seems to have spiked up again since his last report? BOTH hemispheres are warming due an enhance greenhouse effect. Heat is accumulating in the ocean, land, and atmosphere causing both sea ice and land ice to melt. who said they would not be effected by CO2? There is going to be an effect, but until you get rid of biases in climate science that favor warming, we will not have the slightest clue what effect CO2 has on the climate. It could be so close to nothing and over-powered by other processes that we do not understand well enough to make predictions on. Who knows, the science does not study the option: 1)some changes are caused by something other then CO2….. There have been a lot of comments so far, some agreeing and some disagreeing with Joe B, but I believe this is the first to agree with him for the 20-year outlook but disagree for 2011. My prediction is 5.o and my reason is this. Bob Tisdale has published maps of lags between ENSO and northern sea temperatures. Using these, the El Nino of 2009/10 should still be affecting north polar seas in 2011 and the current La Nina won’t help until 2012 or 2013. I have browsed Bob Tisdale’s site and searched on ‘lag’, but not found the image I was looking for. ‘Twould be nice if Bob would visit and give us a link. I’d need to see it again before I could refine my estimate of when this La Nina can help. Yes this months “Men’s Mag had an article by a “Disappearer” he helps people vanish and place all their money in off shore accounts. He said this year almost all of his customers were financiers. I wonder if they know something we don’t, rats deserting a sinking ship comes to mind…. The two nonlinear attractors over the last million years or so have been glacial and interglacial. The next attractor switch will be the first abrupt fall to semi-glacial which precedes the long slide down to full glaciation. CO2 is neither here nor there, it will no more influence the immiment return to glaciation than 2000 ppm CO2 prevented the Andean-Saharan ice age or the 5000 ppm CO2 averted the Sturtian-Marinoan ice age, let alone the ~50% CO2 not preventing the Huronian ice age more than 2 billion years ago. The next ice age is (in geological terms) imminent, and in the face of this CO2 is no more than a fart in a thunderstorm. You are still bandying about chaos and attractor terminology without presenting any model or analogical experimental system – just invoking it as an article of faith. The prediction of an exact amount for the 2011 summer minimum is a matter of luck and not science. There are too many annual variables to make an accurate one-year prediction. Admission of the impracticality of making such a prediction would be welcome and the use of a range of possible numbers would be more appropriate at this point. Hopefully Anthony Watts learned this lesson in predicting a 500,000 km2 rebound in 2010 which saw a new June minimum average and the third lowest September minimum. The 2006 arctic summer minimum was 5.8 million km2 based on the JAXA information, so a prediction of 5.5 million km2 is certainly within a range of possibility; however, the 2006 minimum was followed by the 1.5 million km2 drop in 2007 to 4.25 million km2 so the significance of a single year measurement does not appear to mean much in assessing arctic ice conditions. This also indicates that predicting the summer minimum a year in advance is subject to considerable uncertainty and should be left to those with a crystal ball rather than those with a science background. Predicting the average ice extent minimum for a period of several years appears to have greater validity since it can average out some of the annual fluctuations. The 2010 minimum was 4.8 million km2, so your forecast would require an increase in extent of .7 million km2 above the 2010 level. Predicting such a large annual change is certainly bold, but you have not provided a convincing analysis that this will occur and I doubt anyone can. Your analysis of southern Pacific water temperatures (ENSO events) is not convincing since it is Atlantic water temperatures that primarily influence Artic water temperatures. Additionaly, there are several studies indicating that wind patterns are as important as annual temperatures in determining the annual arctic ice extent minimum. There is no indication in the current sea ice extent numbers that the arctic ice is coming back. The November 23rd numbers are approximately 450,000 km2 and 765,000 km2 behind the 2009 and 20o8 levels respectively. If you compare November 23, 2010 with November 23, 2005 you will see that we are already 643,000 km2 behind the level that produced the 2006 minimum of 5.8 million km2, which is not a very good start. We are 129,000 km2 ahead of the November 23, 2006 level, but since this was followed by the record low in 2007 there does not appear to be much significance that one can attach to these numbers. Again, what experience shows is that making predictions a year in advance has too much uncertainty to believe that anyone can make an accurate prediction. While it is easy to reject the death spiral contingent and those predicting a nearly ice free summer arctic at some point during the years 20 13 to 2019, it does not follow that the rejection of these folks validates an opposite prediction. As for the prediction that 2030 will resemble the arctic ice conditions of 1977, this prediction appears suspect in the face of monthly trend lines that consistently show a downward trend for all months during the satellite record and TSI currently at a minimum level. The ice volume and age estimates of arctic ice do not appear to support the contention that “the ice is coming back”. There may be some short term upticks from the current low levels, but there is no indication that we will get back to the pre-2000 average much less the 1977 level. (What are the ice numbers for volume and ice extent for 1977 that you are using?) It will take a great many years to restore the arctic ice to the quality that existed in 2000. Can you provide the explanation of the specific factors that will cause this to happen? If you are going to rely on a cycle argument, please identify the specific forces that drive the cycle. Made it over the frozen mountain pass. The ranch house is in good working order. No frozen pipes (I worked on prevention measures last week). The temperature is in the single digits at 1:00 PM. The Wallowa and Lostine rivers are about to freeze up along their entire length. Nothing but watery slurry coming down. There are spots here and there that also show freezing starting at the gravel bottom. Two years ago the river froze at one of the numerous bends, raised the water level, and surrounded a house with a shallow lake of ice. R. Gates, you are just talking out of your hat unless you can provide plausible mechanism for your theory. The reason why ice should be greater next summer/autumn compared with this year is because of the recent and current strongish La Nina. There is a several month delay in cooler or warmer temperatures reaching the Arctic circle depending on whether it is a El Nino or La Nina. The recent El Nino warmed the the ocean around the Arctic circle during the summer just gone as this energy finally reached it’s destination. This caused no recovery from last year and the reason why areas further south of 80N had warmer pools, causing ice to melt more than usual. The current La Nina that is recently starting to effect global temperatures will cause cooler pools to move towards the Arctic cricle in several months time, slowing melting down and another recovery by the end of next summer. (2011) With weather patterns in the Arctic the only other major influence in the short time, on ice is the ENSO cycle. My prediction is also an increase in the area/extent of ice next summer, especially between 65N to 80N. OOPS! It looks like I wwent and sent my post twice!! Please delete my second attempt. “The next ice age is (in geological terms) imminent, and in the face of this CO2 is no more than a fart in a thunderstorm. By “immenent” I take it you mean sometime in the next 30,000 years or so. Milankovtich cycles would not support an ice age before that time frame. I never mentioned “attractors” in my immediately prior post when talking about CO2, as it would seem to obfuscate the issue. We don’t know all the attractors in the climate system, though we do know a few. More importantly is the notion that a system, such as the climate that exists on the edge of chaos can be tipped one way or another by the slightest nudge, and this is being proven over and over again in the research that small changes in the climate inputs can, at some critical “tipping” point, lead to big changes in the system. To suggest that just because CO2 is only increasing a few ppm a year is not a big deal ignores the evidence that at some point, the climate regime will shift in a nonlinear, (and not simply logorithmic way). The analogy to a sand pile is quite appropriate here, as you add a few grains at a time and nothing happens and then suddenly, one grain added can cause the pile to collapse to a new equalibrium state. This is a simple example of system at the edge of chaos, not unlike the climate system seeing a few ppm of CO2 added each year. I second that notion. The time lapse SST color chart that shows warmed waters circulating to the poles is a must see. Bob? Can you link us there? My own prediction is that we will know the answer to this question in 5-7 years, as I expect sea ice extent, area, and volume to rapidly decline…. ….. If he’s right, more power to him and good news for the world. If not, well, real problems lie ahead, especially if the frozen methane hydrates thaw. I agree that we should know in about five to seven years. However if Joe Bastardi is correct we will be in a world of hurt especially if the idiotic politicians curtail our energy use and continue wiping out farmers at the rate they have in the last decades. High energy costs, High food costs, Curtailed food production, Major cold and the realization that the politicians and news media have been lying to us so their wealthy “friends” can become even richer is a sure recipe for trouble a la French Revolution. All it needs is a major earthquake interfering with world food production to ignite it because the politicians, at least here in the USA, scrapped the strategic grain reserve programs at the request of the grain traders. …As suggested by others, a far more efficient and effective method for relief of those in need during difficult times would be a monetary trust held in reserve to purchase commodities when needed. They were correct. We had record high prices, food riots, children starved to death and of course the grain trader Cargill had record earnings. Very nice. I am glad you added text for those of us interested but ignorant. Thanks. Once again Gates, you fail to present your mechanism for a fragile climate system. So you new term/phrase is “on the edge of chaos”. Do you stay up nights thinking of new terms!?!?!? I think you’re making it up as you go along, much like the calm soothsayer in “The Life Of Brian”. I bring it up occasionally for the newbies/trolls. If CO2 is preventing the start of another Ice Age, I think I will buy a coal burning stove to heat my house…. …..BOTH hemispheres are warming due an enhance greenhouse effect. Heat is accumulating in the ocean, land, and atmosphere causing both sea ice and land ice to melt. You are a tad bit out of date. NASA reports the PDO flipped to the cooling phase and “Bottom Falling Out of Global Ocean Surface Temperatures? Having just returned from another New Orleans meeting – this time, a NASA A-Train satellite constellation symposium — I thought I would check the latest sea surface temperatures from our AMSR-E instrument. Actually, burning coal and natural gas will likely be our future in an ice age, but only in the beginning. The drawback are where these deposits can be found. In an ice age, much of our resources will eventually be under miles of ice, including our temperate forests. As the population moves South to stay in front of the ice, we will have fewer heat resources. Burning animal dung, brush, and other dry savanna scrub will be our go to source of heat. That wouldn’t bother me much. When we were kids we used to play dodge ball out in the field with dried “chunks”. I’ve pondered this now and then and it seems the answer might be ice tunnels. I’d think it would be rather dangerous, but we certainly have the technology right now for boring transport tunnels through ice. Think “Ice Truckers” but upside down and there’s no melt season. Have you published a peer reviewed paper that supports the conclusion that Arctic ice conditions in 2030 will be similar to conditions seen in 1977 or can you cite a peer reviewed paper that supports this view? I have found one item, Climate Change in Eurasian Arctic Shelf Seas: Centennial Ice Cover Observations By Ivan E. Frolov, Zalmann M. Gudkovich, Valery P. Karklin, Evgeny G. Kovalev, Vasily M. Smolyanitsky, which suggests that there is a 60-year “natural cycle” that will cause the Arctic ice extent to rebound, but this is not a peer reviewed study and it does not identify what the natural forcing elements are that drive the cycle and the time period used to establish the cycle is only 85 years (too short to establish whether the 60 year cycle is a permanent or temporary cycle or whether the cycle time period is accurate) and the area surveyed does not include the entire Arctic. I have been looking for an analysis that sets out the specific mechanism for Arctic ice conditions to return to 1977 levels with a chart or a graph showing annual predictions comparable to the multi-year projection by the IPCC below and have not found it, can you provide a link? On the question of ‘returns’ (in this case going backwards in time) of low arctic ice conditions useful data which doesnt often see the light of day is the the UK Met Office Library thanks to the HMNavy/Her Majesty’s Stationary Office (HMSO). All changes in the Arctic & Antarctic follow natural highly variable patterns. They are not new or special and have been recorded for over a thousand years and have been very well known to the British navy for a long time and available in the Met Office library**. The Antarctic has been cooling for decades & the Arctic has started to cool in the last year or two. Ice break-up is a natural process and has been happening for millions of years – before media noticed. from 1020AD to 1200AD yet there was plenty of pack ice through the rapid expansion of industry since 1900 (Fig 126 page 257). I cannot comment on Joe’s 2011 Arctic ice prediction , but I tend to agree about his 2030 prediction . The historical pattern of Global Mean Temperature Anomaly suggests that the anomaly may continue its decline until 2030 from its current level of 0.391C [HADCRUT3] down to about 0.06 which is about the level it was in the late 1970’s and early 1980’s .T o me it appears that this decline is underway but may be periodically be interupted by El Nino’s. One would expect more La Nina periods than El Ninos during the next 20 years to bring this about. Already we have had two in a three year period. Bob Tisdale recently wrote about the impacts of La Ninas and EL Ninos on global SST’s which in turn affect global temperature anomalies . Made it over the frozen mountain pass. The ranch house is in good working order. No frozen pipes (I worked on prevention measures last week). The temperature is in the single digits at 1:00 PM. Stay warm, Pamela. Correction, though: He is not talking out of his hat, but out of his ars*. And so does the BBC. Same subject, different location, climate change, melting ice all bad for polar bears. Very tiresome, very boring and as real world events continue to oppose the climate fiction (read blatant lies) extremely stupid. Hi, Pamela! You’re now almost exactly 400 mi. SE from where I type at the moment. But I’m only at a hundred feet or so altitude, so it’s only about 27°F, not your mountain plateau cold stuff! Much colder and snowier than normal; running about 12°F below average. Thanks Piers Corbyn! I myself appreciate it! Agree….the driver of all these climate drivers is unique, there is no coincidence going on here. One of our posters has made this claim anyone like to comment? The whole “Bastardi theory” is just unsubstantiated words that just don’t hold up to scrutiny. I’m no scientist but when I look at the historical graphs for temperature in the Artic it seems to suggest that how cold it gets or vice versa deon’t seem to be the only reason for more or less ice. I’m aware that wind has been put forward as another reason for less ice too. It’s obviously far more complicated than anyone seems to understand at the moment and the more/less ice is convient to fit into any given viewpoint of which there have been many. Anyone with more than a few brain cells and no political requirement to feed knows that AGW is nonsense. CO2 isn’t a culprit since that lunacy grew out of Thatchers desire to remove the dependency on coal for energy generation and stop the miners holding the UK to ransom. Can all this nonsense end please. It is tedious ot the point of craziness. Ice moves. All the time. It moves faster than a rock tunnel does. Way faster. The ice tunnels would break apart before they could be used for extraction. And reinforcing them would be impossible. Miles of moving, shifting ice will crush any reinforcement you could think of. And a staunch warmist could say the exact same thing about the AGW skeptics and so this clearly shows the extreme gap between some warmists and some skeptics, for I have no political agenda at all, have been studying AGW as an educated but non-professional scientist for over 30 years and have come to the exactly opposite conclusion. Perhaps you would argue, I have “less than a few brain cells” then, and that’s fair enough, but I think your assertion that only stupid people or politically motivated people still believe in AGW is somwhat simpleminded in itself and doesn’t speak to the complexity of the issue. There are thousands of dedicated scientists who believe AGW is real based purely on the science, and for you to suggest that they have less than a few brain cells tells me your statement is more emotional than rational. Once again Gates, you fail to present your mechanism for a fragile climate system. So you new term/phrase is “on the edge of chaos”. and then perhaps go here. The climate (and hence weather) are systems existing on the edge of chaos, with small changes leading to big differences. From Milankovitch cycles to El Nino/La Nina cycles , we see this happen at all levels. The central issue in the AGW debate is not about whether the climate is a system existing on the edge of chaos, but rather, how sensitive is the climate to the year by year increase that humans have caused since the 1700’s? I wondered how long before the old nugget of ‘if it hasn’t been peer reviewed it can’t be science’ would pop up. I guess gravity didn’t exist until Newton wrote about it and things didn’t float until Archimedes jumped out of his bath. As for the IPCC I won’t trust their data as far as I could throw one of the many Polar Bears roaming around that big bit of ice up North that obviously must be a figment of our lurid imaginations. Put me down for 5.2 on the Arctic sea ice lotto. “There are thousands of dedicated scientists who believe AGW is real based purely on the science, and for you to suggest that they have less than a few brain cells tells me your statement is more emotional than rational”. So you have to be a scientist to hold an opinion. Scare stories about theories. Rent seekers. You name it. Of course we also have the NGOs. a common theme runs through the whole lot. Money. The need for money. If it looks like a scam and it smells like a scam it’s a scam. Don’t take the high ground Mr Gates. People have opinions. I’m just sick to the back teeth of people who should know better and who don’t have a tiny percentage of supposed knowledge that they think and claim they have feed nonsense to politicians who then pass it on to the population in the form of taxes and higher energy costs. You have contradicted yourself, for example how can AGW not possibily be nonsense when you own up to not even knowing the sensitivity is to climate. This issue that grabs so much attention is because the claims suppose to cause dangerous global warming that causes chaos for milllions/billions of people. There is no evidence at all for this, so with the usual claims AGW is nonsense. There are not thousands of scientists that agree this, but rather CO2 should have at least some effect on global temperatures in future. What is the sensitivty of CO2 with climate, high or low? The reason why I ask this is because if it is high there would have been no stable global temperature period for numerous years. Hence, false that most of the recent warming is anything to do with CO2. If it is low you will find that virtually all the rise in global temperatures has occurred in sudden bursts mainly related to El Ninos or ocean shifts. Therefore where is the evidence for this sensitivity? Just to be clear: Mr Bastardi, on what data set is your prediction based (IJIS, NSIDC)? Is your minimum extent number for the September average or for the absolute daily minimum? My opinion: the ice is thin (CryoSat data will probably confirm this soon). We saw that this summer, with an unprecedented spreading out of the ice pack, leading to large swathes of open water in the interior of the pack. It’s just a matter of time before the ideal melting conditions come about (like they did in 2007). If that happens in the summer of 2011 there will be a new record minimum extent. If something like the past summer happens, ie the Beaufort Gyre stalling, increased cloudiness and low temperatures for 6 weeks during the period of peak insolation (when open sea water gets heated up most, determining in large part the last phase of the melting season), extent will probably go below 5 million again. Unless something spectacular happens this winter and there is no Beaufort Gyre, no positive Arctic Dipole Anomaly and a reduced warm ocean water flux, I don’t think Mr Bastardi’s prediction will come about. But you never know. Everyone can win the lottery. So the Arctic death spiral will contine – unless it doesn’t. I never mentioned “attractors” in my immediately prior post when talking about CO2, as it would seem to obfuscate the issue. “Sudden change of regime in a system at the edge of chaos” – this means a transition between attractors. You didn’t use the word but it couldn’t mean anything else. You are still and repeatedly using chaos and nonlinear / nonequilbrium pattern as a very vague and nebulous argument without proposing any clear mechanism or analogy. How exactly is a rapid change in a trace atmospheric gas supposed to tip the climate into an attractor – transition? A lot of assumptions underlie this – chiefly that CO2 is driving global temperatures, which is contradicted by the geological record. The geological as well as the evolutionary records and persistence of complex ecosystems for hundreds of millions of years points to climate stability and resistance to forcing – certainly not to a system on the edge, ready to fly off into positive feedbacks at the slightest variation of none of the very many potiential climate drivers. If you are indeed interested in edge of chaos nonlinear dynamics, read up on Lyapunov stability. The sensitivity of the climate to changes in CO2 levels is EXACTLY the point of all the study going on. No one knows exactly how sensitive it is. This gets back exactly to the point about the climate being a system “on the edge” of chaos. How much of a nudge does it take to change this system to different state of equalibrium? There are some skeptics who wrongly believe that because CO2 has a logarithmic effect as a greenhouse gas that this must mean the total effect on climate is purely logarithmic, but this is not how systems on the edge of chaos work. Energic systems on the edge of chaos, such as the climate can react in a very smoooth manner, (linear or logarithmic) to a change for a period of time, and then reach some deterministic but not predictable point when there will be a shift to a new regime. There are several potential mechansims where these tipping points could be related to CO2, from changes in the thermal profile of the deeper ocean current (affecting things like the PDO & AMO, El Nine,etc.) to changes in the thermal profile of the atmosphere, which would then affect major weather patterns and the hydrological cycle, etc. The climate (and hence weather) are systems existing on the edge of chaos, with small changes leading to big differences. From Milankovitch cycles to El Nino/La Nina cycles , we see this happen at all levels. The central issue in the AGW debate is not about whether the climate is a system existing on the edge of chaos, but rather, how sensitive is the climate to the year by year increase that humans have caused since the 1700′s? A) Big assertion in regard to weather & climate being “on the edge of chaos”. Perhaps they appear that way due to insufficient external factors being considered and/or too short of observation periods. The geological as well as the evolutionary records and persistence of complex ecosystems for hundreds of millions of years points to climate stability and resistance to forcing – certainly not to a system on the edge, ready to fly off into positive feedbacks at the slightest variation of none of the very many potential climate drivers. If you are indeed interested in edge of chaos nonlinear dynamics, read up on Lyapunov stability.
? I am wondering what planet you are talking about? Certainly on earth we’ve not had any stable complex ecosystem lasting “hundreds of millions of years”, rather we see constant change and disruptions leading to the extinction of many species on one hand which creates new ecological niches for others. Tell me of an era of “stable complex ecosystem” lasting hundreds of millions of years here on earth please? Crocodiles have lived on this planet for 200 million years, and sharks and coelacanths for about 400 million years. The horse shoe crab has lived for 450 million years. The list could go on. The long survival of any species tells us a lot about the earth’s ecosystem and climate. The survival of a species depends on many things – a favourable temperature regime has to exist, without too much variation, and a continuous supply of appropriate food organisms. Each of these food organisms in turn needs to be supported by its own climatic demands and its own supply chain of food organisms and resources. It is an analogy to the survival of a business – an uninterrupted cash flow is needed, and a chain of other businesses which are suppliers must themselves survive. A degree of economic stability is needed for a business – particularly a large one – to survive for a long time. Thus the persistence of complex multicellular life, including large organisms, for about half a billion years, points to the clear fact of a relatively stable climate and environment on earth for all that time. Our own existence and that of the wonderful biosphere with which we share the planet, is evidence of this. Catastrophic events such as flood basalt volcanism and meteorite or comet impacts, along with global ice ages such as the Ordovidican-Silurian (or Andean-Saharan) were the cause. The largest of these was the end-Permian mass extinction, possibly associated with Eurasian-Siberian flood basalt volcanism, with or without help from an extra-terrestrial object; this was a particularly severe extinction since the oceans became briefly anoxic. In addition to these epoch-defining catastrophes, there have been more prolonged climatic shifts. The spread of living organisms – particularly plants – onto land changed the land surface from arid to verdant and sharply reduced global temperatures (toward a much more life-friendly regime) due to increased clouds and rain. There has also been a sustained fall in temperatures during and since the Cretaceous, favouring the spread and dominance of furry mammals over hairless dinosaurs. None-the-less, the history of the biosphere points to remarkable climate stability. There is an organic linkage between the biosphere and climate – Lovelock’s Gaia hypothesis is largely true, the biosphere has hugely affected climate in its own favour – first by photosynthetic bacteria achieving the colossal feat of changing the planet’s atmosphere from a reducing to an oxygenated state – this also profoundly changed the planets geology, stripping iron from the oceans by oxidation for example. Then by plants and trees for accelerating the hydrological cycle over land. It would be extraordinarily arrogant if the AGW movement, having edited our recent climate history, found it necessary to re-write climate and biosphere palaeo-history, to create a completely false picture of instability, in order to give artificial support to the notion of CO2 driven catastrophism. The evidence to contradict this – pointing instead to remarkable stability – is overwhelming and is all around us. So I guess we humans are the exception to the Gaia hypothesis, ruining the biosphere by urbanisation and bringing catastrophic warming by CO2 emissions? This view may not be fully justified (although humans have without doubt significantly damaged the biosphere). CO2 levels in the recent glacial period have dipped below 200 ppm. This approaches the level of about 160 ppm where photosynthesis becomes limited. This is a serious threat to the biosphere which stands on a trophic pyramid with photosynthetic primary production at its base. It is reasonably arguable that the emergence of H. sapiens and our emission of CO2 by burning fossil fuel – is in fact a positive Gaia response to preserve a life-supporting planet, by restoring higher and more life-friendly CO2 levels (see the recent WUWT thread on Californian redwoods). An interesting thought, but Gaia it seems already has a method to ensure that CO2 levels are maintained at life-sustaining levels, and that would be the weathering of rock through the increase in the hydrological cycle when CO2 levels get too high. An acceleration in the hydrological cycle (increased movement of water from ocean to land and back again) comes with higher temps, and the reverse is true with lower temps. The idea that “Gaia” would rely on a species to ensure that CO2 levels are maintained seem a tad quasi-spiritual but hardly scientific. I don’t think “Gaia” works on the species level at all, but rather larger scales of maintaining a planet that can support life, just as natural selection could care less about individuals but rather the species. The ice cube in the middle came from solar dimming. The only reason much of the NH wasn’t an ice cube is that Eyja rarely shot anything into the stratosphere. The warmth away and often well away from the cube in the middle came from ash aerosols, which readily absorb solar energy and produce heat in the surrounding air. The humidity from all the water vapor was downright unpleasant. Place a glass container full of air outside in the sun and place another outside that is full of smoke, which one will be hotter in an hour? The total weight of volcanic debris is estimated to be between 300 and 400 million tons and it is believed that almost 100 million cubic meters of ice melted during the eruption. Eyja was pushing out the equivalent of 150, 2 ton F-150 pickup trucks in ash a second, at times for days on end. Probably melting 20+/sec in ice volume. A 2011 minimum prediction of 5.5 million km2 looks a bit high (assuming he is using NSIDC determined minimum as the reference), but as he stated above, is below the 2006 minimum of 5.7 million km2 and above the 2005 record setting minimum of 5.32 million km2 (the average September 2005 extent was 5.57 million km2). The 2007 minimum is the current minimum record holder and per NSIDC was 4.13 million km2 with the average September extent 4.3 million km2. The 2010 minimum per NSIDC was 4.6 million km2 with the average September extent 4.9 million km2. 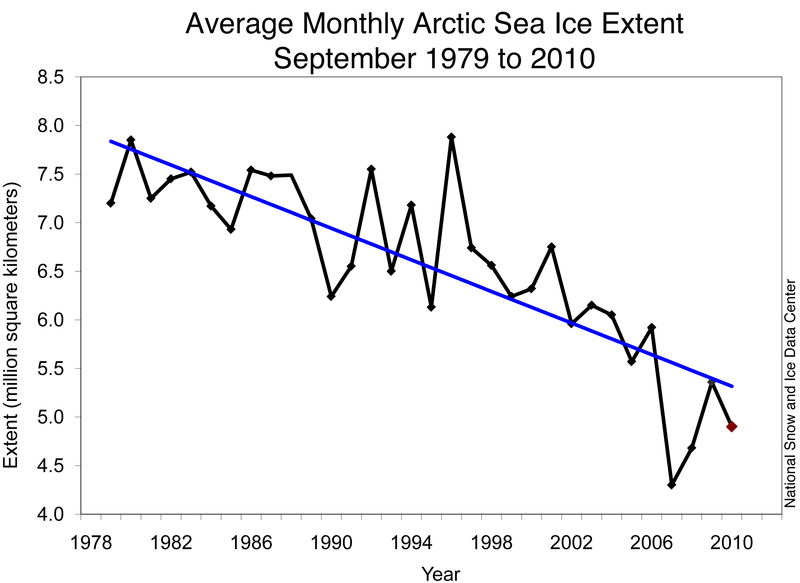 The 2010 average fell below the linear trend line posted by NSIDC at http://nsidc.org/images/arcticseaicenews/20101004_Figure3.png so an uptick in 2011 from the 2010 level is within expectations. However, to reach the minimum of 5.5 million km2 predicted by Mr. Bastardi there would have to be a single year rise of .9 million km2. While this is within the range of the possible, a single year increase this large is not likely based on current ice volume levels and past experience. By reference, the 2009 minimum was 5.1 million km2, thus the 2010 decline was 500,000 km2 from the prior year. Current ice extent figures do not offer any predictive value. 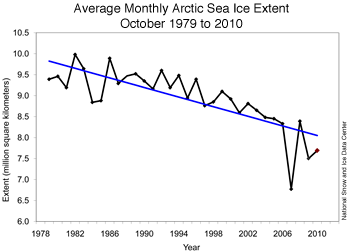 The November ice extent was the second lowest extent and was only 50,000 km2 over the record set in November of 2006. http://nsidc.org/arcticseaicenews/ Generally, the December 31 sea ice extent per JAXA appears to hover around a “choke point” of 12.2 to 12.4 million km2., regardless of the November 30 level. Such a narrow range does not offer any clues as to the future ice minimum. Using a range of + or – 500,000 km2 from the 2010 minimum (an arbitrary range), the 2011 minimum would fall between 4.1 million km2 (the 2007 record) and 5.1 million km2 (the 2009 level). Even the high end of this range is 400,000 km2 below Mr. Bastardi’s projection. 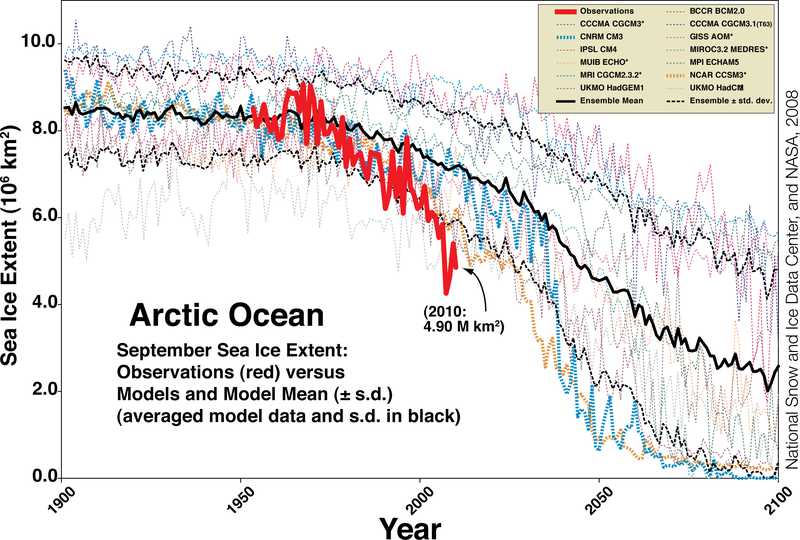 The declining linear trend line from the NSIDC chart is not valid as a predictor of future ice extent as the remaining ice at the September minimum consists primarily of ice from the Arctic Basin as defined by Cryosphere Today at http://arctic.atmos.uiuc.edu/cryosphere/IMAGES/recent365.anom.region.1.html . The decline of ice extent (the link at Cryosphere uses area, but is a reasonable approximation of extent) in the Arctic Basin region has not been as fast as the Arctic as a whole, and therefore, I believe the NSIDC trend line overstates the possible future decline of Arctic ice and do not subscribe to the “death spiral” scenario of an ice free Arctic by 2016. While the prediction by Mr. Bastardi is a bit high and appears unlikely, it is not a prediction that would indicate that the Arctic ice is making a recovery as it is still below the 2006 minimum. The 2006 minimum was followed by the 2007 record low minimum, thus, even if Mr. Bastardi’s prediction for 2011 is correct, it would not be sufficient by itself to indicate that the decline in Arctic ice had stopped. While Mr. Bastardi predicts that the ice extent will return to 1977 levels by 2030, there is no current indication that the Arctic will return to even the September average ice extent for the period 1979 to 2000 of 7.04 million km2, but it is fun to watch.